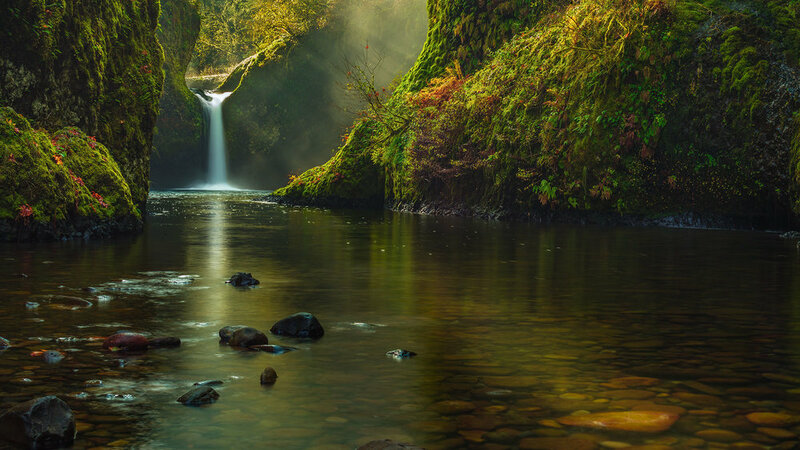 Punch Bowl Falls is possibly the most photographed waterfall in the entire Pacific Northwest. Rarely does a year go by without seeing Punch Bowl Falls featured on a major calendar or showing up on a list of favorite destinations. There are two classic vantage points to photograph this awesome waterfall: one from above (Upper) and one from below (Lower). The image above is from Lower Punch Bowl Falls. Because of the picturesque natural beauty there are many, many tourists and photographers that make the trek to this location. If you want a great shot without competing for space, you need to arrive early in the morning.